It was the palace and happened to be in Goreyo so it can't remain calm. King Wang So as announced to take care of all those who doubt him for stealing the throne or points him to be unfair no one should left. After this announcement he announce the punishment for 14th prince Jung as he doubted him and raise question of suspicion of him he would be kick out of the palace. All the grades and positions will be taken off and he had to be sent to his hometown. 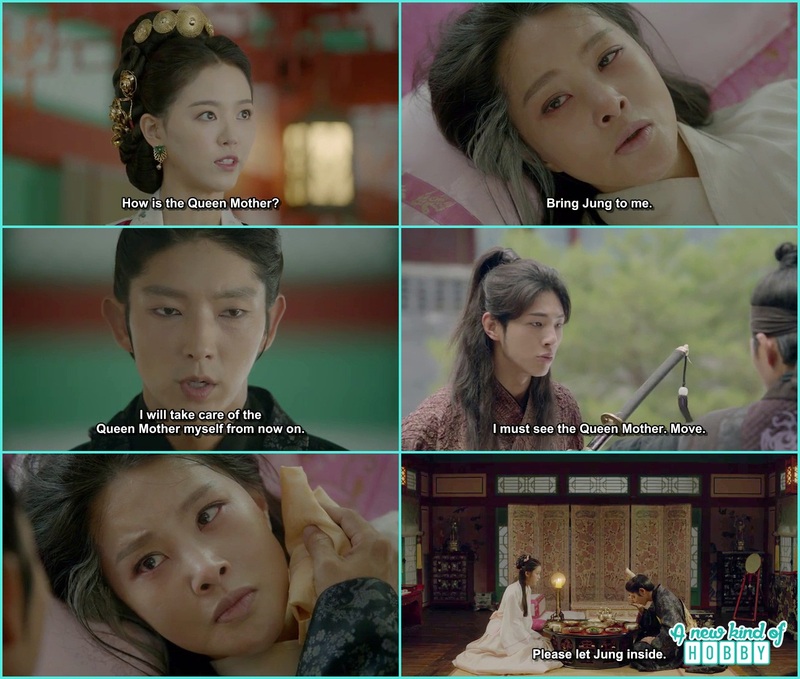 This news was a sever shock for Queen Yoo and every one else.She become ill and wanted to see his son Jung as the Kings order Jung wasn't allowed in the palace. He also told every one if someone favour and let Jug in he will have to face the sever punishment. He took took over the charge to take care of Queen mother Yoo by himself and told no body else would allow to visit without his permission. Hae Soo persue the king not to do this and she was also blamed and scolded for taking side. The King told Hae Soo that everyone should be thankful that he didn't ordered to kill him and he is alive. If he will tried to come to the palace he will be executed as it was already announce. 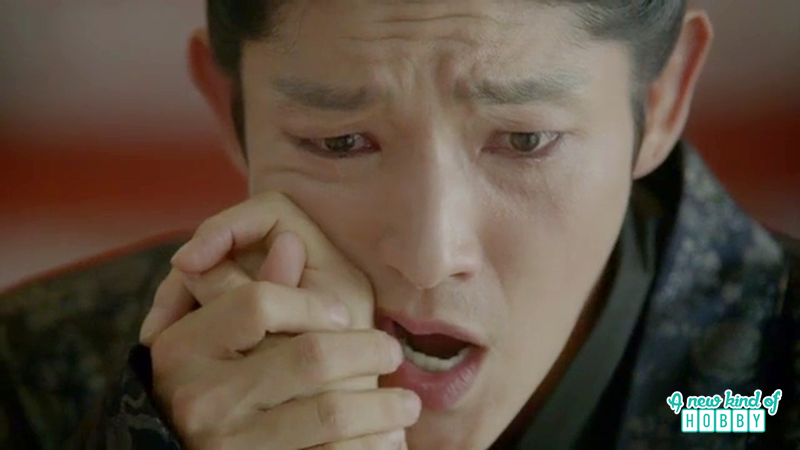 Baek Ah feel bad for Jung as he was out of the palace from last 5 days he didn't eat nor drink. Baek Ah bought water for him but he just splash the water over his head. May be he wanted to cool down his temper. On the other hand Queen Yoo was on strike as she wasn't feeling well she wasn't eating neither taking her medicine. It was King Wang Soo who nursed her Queen mother but she was so presistance that she don't want to see him around. King Wang So don't want to let her mother alone he didn't give up he tried to take care of her bur of no use as still Queen Yoo didn't acknowledge. It breaks King Wang Soo's heart he just then burst out in despire. It was a flash back scene in early episodes when Wang So after killing the people at the temple came to meet Queen Yoo how she rejected him back then also and he reminded Queen Yoo her words that he won't give up on her no matter what and he will be the one to stay by her side. Finally his words become the mark of time and he was the one who was by Queen Yoo's side. The elder son KinG yoo died of illness, the younger one who was the star of Queen Yoo's eyes was demolished of his position and sent back to his home town. Though it was the cruelest reality we wonder why Queen Yoo can't acknowledge Wang So. The King now became angry as of what's his fault that she can't see him even if he is infront of her eyes. Moreover he told the Queen that he will do everything for her as the duty of the son. He will build the greatest temple in Goreyo and let the people knew good stories about his relationship with his mother Queen Yoo. It was too late finally Queen yoo feel the pain King Wang Soo suffered through out his life. She managed to move her hand and wanted to touch King Wang Soo's face where she left him the ugliest scar as the lifetime gift. It was her last moments. Finally she left this world and leave the pain for King Wang So along with Jung. King couldn't bear this as it was too hard for him. But still Queen mother left him her last moment and the last feeling of touch. Wang So cried holding Queen mothers handbut the time took many things away. Hae Soo bring Jung in so he can see off Queen mother. King was angry on Hae Soo again as he think Hae Soo was favouring and picking side on Jung he couldn't see him. But from Hae Soo's point of view what she did was not a favour but humanity. Wang So with the grief heart told Hae Soo that it was the first time in his life before leaving this world Queen mother tried to touch the wound on his face and it took 25 years he waited for this moment alone. He don't think its wrong for him to send his mother on his own the way he wanted. 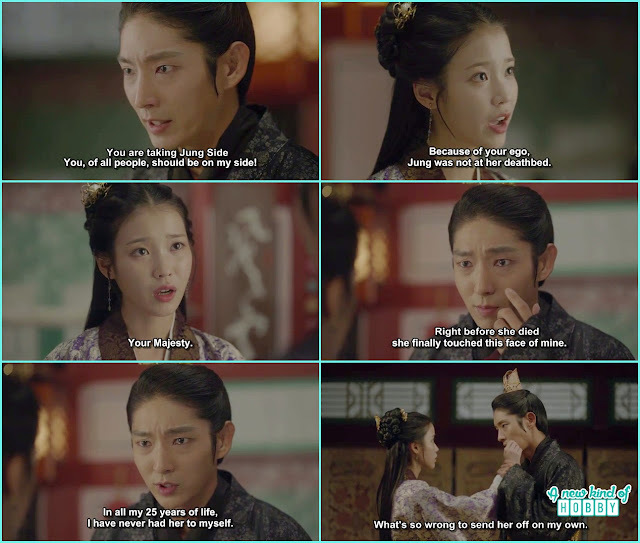 Also King Wang So didn't forget to complain Hae Soo why every one treat him like this even she should understand how he feels. It was a sad episode where one queen Yoo left and leaving the other Queen Yoo aka Yeon Hwa behind.